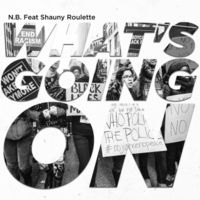 The creation of this song was based on the senseless killings of minorities by police all across the world...and also the senseless killings of black on black crimes accross the world...Last but not least.... racism still exist in this world #whatsgoingon ? Norris Bennett A.K.A. N.B the Rapper/Sanger Dude was born in Douglas, GA. N.B moved around a lot as a Child due to his father’s career in the military. While constantly traveling, and discovering different cultures as well as environments, doors were opened to many things. Eventually it turned into his life’s mission to become an entertainer. Starting around the age of four N.B would sing as well as perform for family, friends, neighbors, and anyone around whom was willing to listen. Whenever music came on, N.B was front, and center doing his thing. That was the start of his lifelong passion of music, singing, performing, as well as all around entertaining. Having a vision of controlling his own destiny N.B decided to make it happen Independently for himself,and South Georgia as a whole. N.B became a man on a mission, to be heard,seen as well as taken seriously in the music industry. He set his sights on mastering his singing voice. Shortly after that N.B began to rap. In 2006 he decided to quit his job to pursue music full time. Although his influences are T.I, Ludacris, R.Kelly, Musiq Soulchild, T-Pain, and Usher. N.B strives to be different, while standing out as an entertainer that's continuing to grow and develop his talents. In 2010 he relocated to Florida, one of the best decisions he's made in his career. He began doing shows in Orlando, Daytona, and other parts of Florida, doing both radio and magazine interviews, mixtapes, and even making his acting debut on TruTv's South Beach Tow Season 3 episodes 16, 17, and 18. He also appeared in "Web Series" by Comedy Flo Entertainment. He also was on"Ballers" a new series for HBO staring Dewayne "The Rock" Johnson playing the part of Vernon's Crew. He was also casted on Alvin and the Chipmunks 4 as a Paparazzi . N.B has also recently inked a co-publishing deal with Kicksta Muzik Publishing (BMI) to assist him with film and television placement opportunities. Honestly I can say that just the verse that I heard alone speaks so much truth and it also incpires me to continue to write about everyday struggles and everyday pain. Keep up the awesome inspiration and I hope that some day I can collaborate with you. Much love and support from me to you.